Download the .pdf version of this article. Yesterday, we talked about water and how essential it is to our health. Today we are going to talk about the importance of exercise. Exercising is one of the most important activities we can do to improver our health and the quality of our lives. Knowing that we need to exercise is not the problem. We all know we need to exercise. The problem is our own lack of self-discipline. We have talked about self-discipline over the last few weeks. Exercising, for most of us, is just not on our top ten list of Fun Things to Do With Our Time. I have gone from being a skinny Eat-Anything-I-Want sort of girl to being a Watch-Everything-I-Eat sort of Woman. It has not been a joyful experience. But I have learned a lot about what it means to take care of my health. When I had no issue with my weight, I had no real desire to be fit. (Yes, it is possible to be skinny and in bad shape.) So, whether you are as skinny as a rail or could stand to lose a few pounds, exercising is something you can do for yourself that will really make a difference in your life and maybe even the lives of those around you. 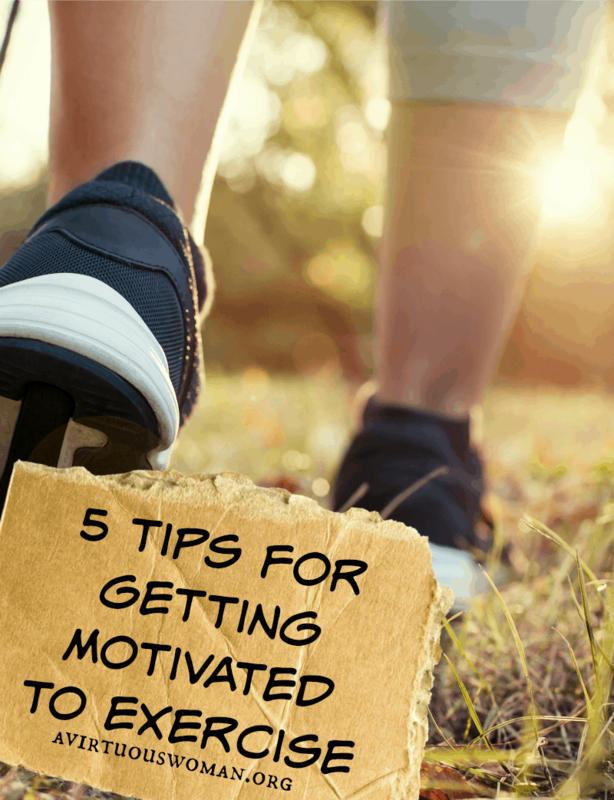 So, how do we find the will power or self-discipline we need to get moving 6 days a week? First, we go to God and ask for the strength and the motivation we need. Your Heavenly Father wants you to be healthy. You can trust that He will help you. Each day, as you wake up early and go to your prayer corner for your time with God, ask for help in this area. Add it to your prayer list. Be faithful to pray for yourself! #1 Find a friend to exercise with. Having a partner to experience the joy and the pain of getting fit can really help! If you don’t have a friend who wants to get in shape, advertise! Place an ad in your local paper or post flyers at the park, library, and/or grocery store. #2 Use a program you can enjoy. Join a group or start one! Pilates, Aerobics, or Strollercising are some fun ways to enjoy getting in shape. See what your area has available. #3 Purchase workout clothes that make you happy. I love working out in my good looking yoga pants and matching tops. Instead of looking frumpy in a sweatsuit or sloppy shorts and t-shirts I can look stylish while I workout – even though I workout by myself. Workout clothes that are designed for exercising are comfortable to move in and will keep you cool. Yoga pants stretch and move with you. If you are comfortable and look good you will be more likely to keep it up. #4 Get a puppy. Walking is one of the most effective and easiest forms of exercising. I love walking my Labrador Retriever every morning. He makes it fun! Walking is also a good time to reflect on what God has planned for your day. Enjoy the nature around you! 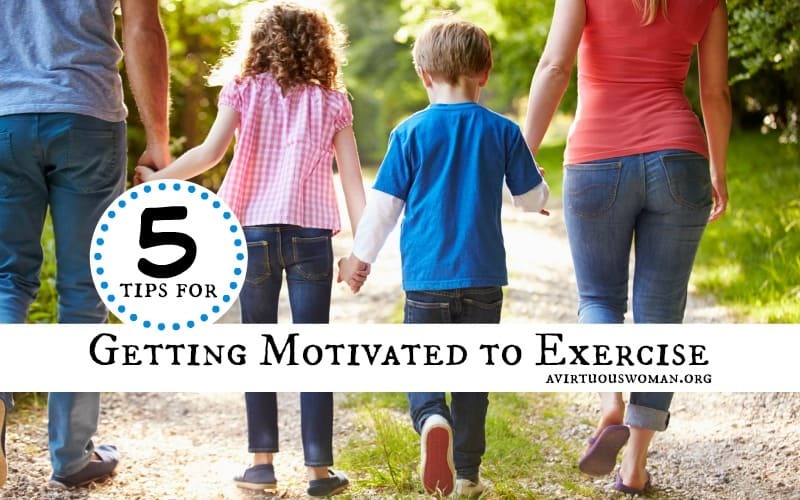 #5 Exercise with your children. My daughters love to exercise with me. They gain a healthy body image and get in shape while developing a good habit that will serve them well as they become adults. Exercising daily should be a priority. It doesn’t have to take long. A 15 minute walk each day is enough to help you lose weight, lower your cholesterol, prevent heart disease and more! We all have 15 minutes. Just schedule it in. Press play to listen or click here. Do you struggle with finding time to exercise? Have some tips for the rest of us? Please share! Thank you for encouraging people to get out there and exercise! Like you said, those early morning sessions are a great time to reflect and to pray. Getting out there with your daughters is excellent to teach them how to be healthy! Keep up the good work! Hi Dawn, glad we're on the same page. ;) I hope you'll visit again soon! Thank you for this reminder. This is something I have struggled with for many years. I was active in high school, having participated in numerous sports. But as I became a mother to 5 I pushed taking care of myself to the bottom of my priority list. I am nearing 40 now and know that the weight will not come off as easily. I definitely need motivation and will power. You can do this, Gina. I know it! With God all things are possible.